EL James. A woman who has rocked the literary world for a multitude of reasons. 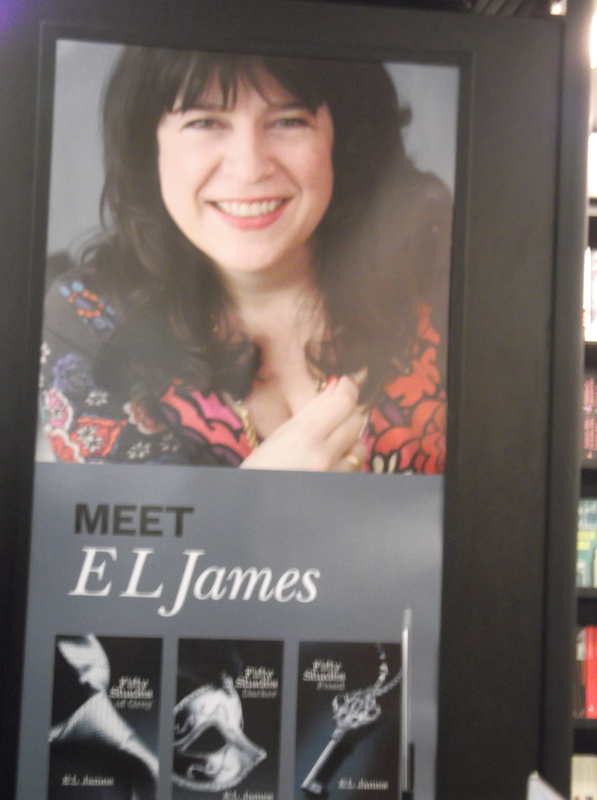 As a Seattlite, when I saw that Waterstones was having a book signing with the (in)famous EL James I marked the date on my calendar. As fan fiction from Twilight, James set her ‘stories’ in Seattle and her books have created a phenomenon, I had to go and document the event. Please click the photos to enlarge, apologies if they’re a bit blurry. I didn’t attend to tell her what I thought of her writing. I didn’t attend to be mean. I attended because it was an event I couldn’t miss. I knew it would ridiculous, I knew there would be loads of people. I didn’t buy any of the books myself. I brought the one a friend had given me, charged my camera and off I went. 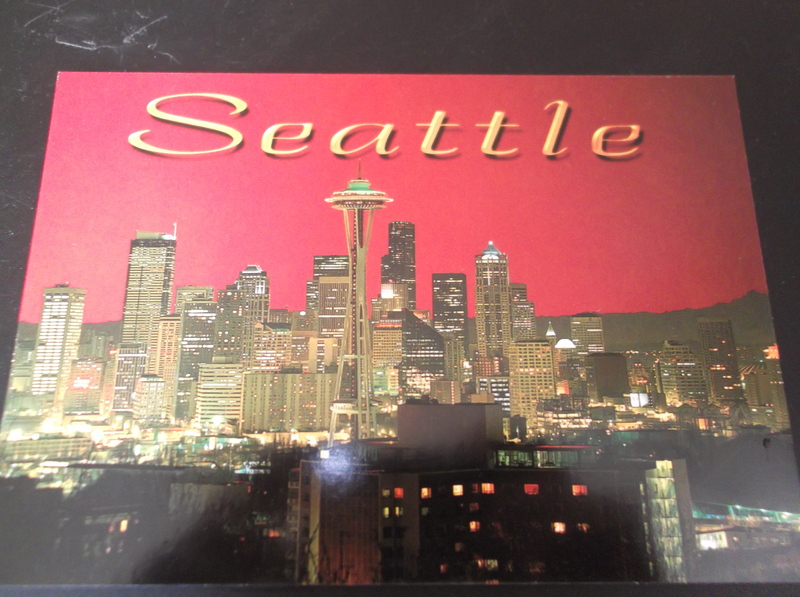 I brought along a postcard from Seattle. 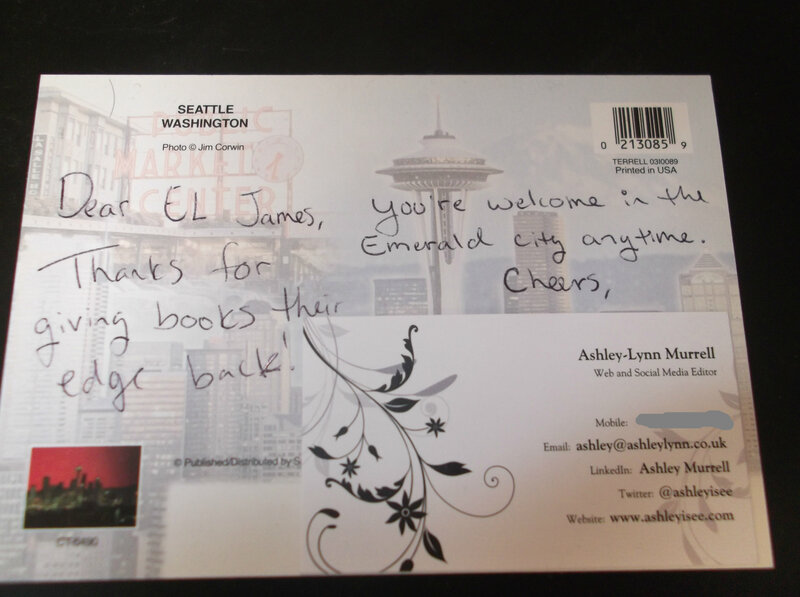 I wrote EL James a nice message and included my business card. Cheeky. 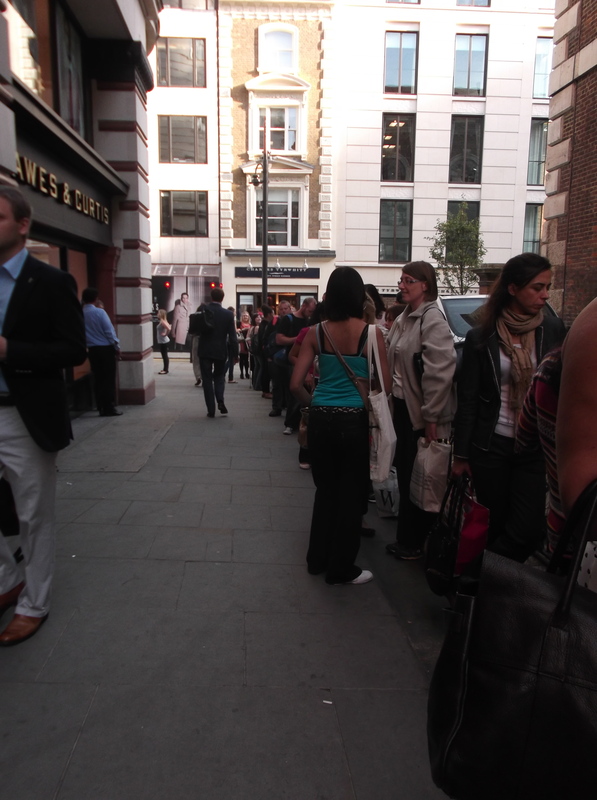 I had planned to stake my place in the queue two hours beforehand. 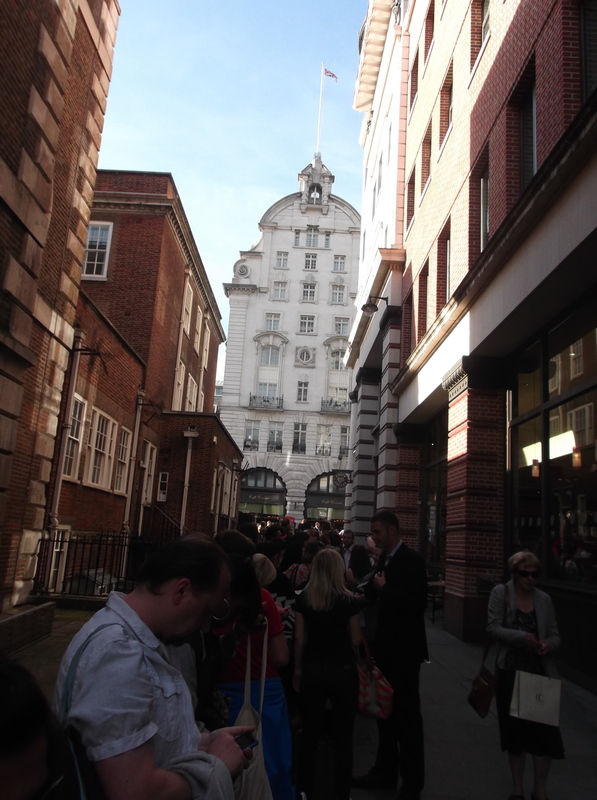 But I had things to do and time got away from me and I ended up getting to Waterstones at 5pm. The event started at 6:30pm. 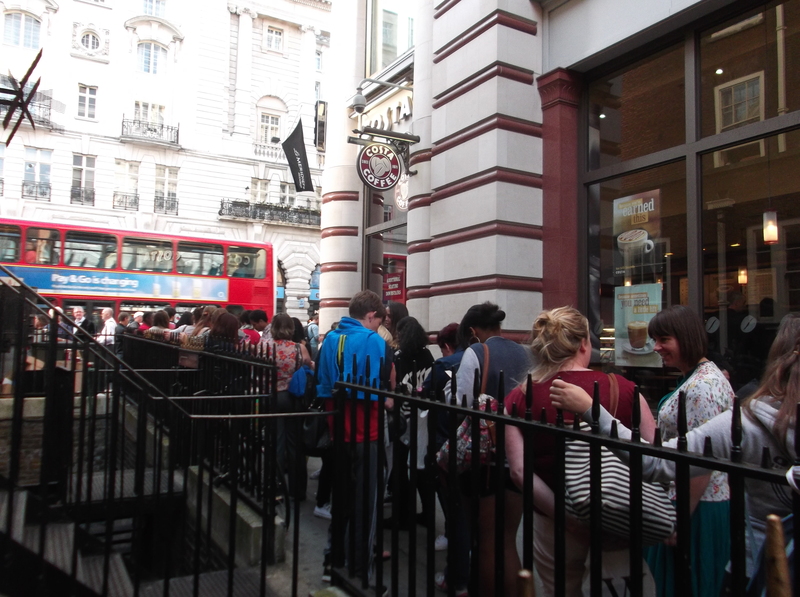 Here’s the queue when I got there and after standing around for an hour and a half. 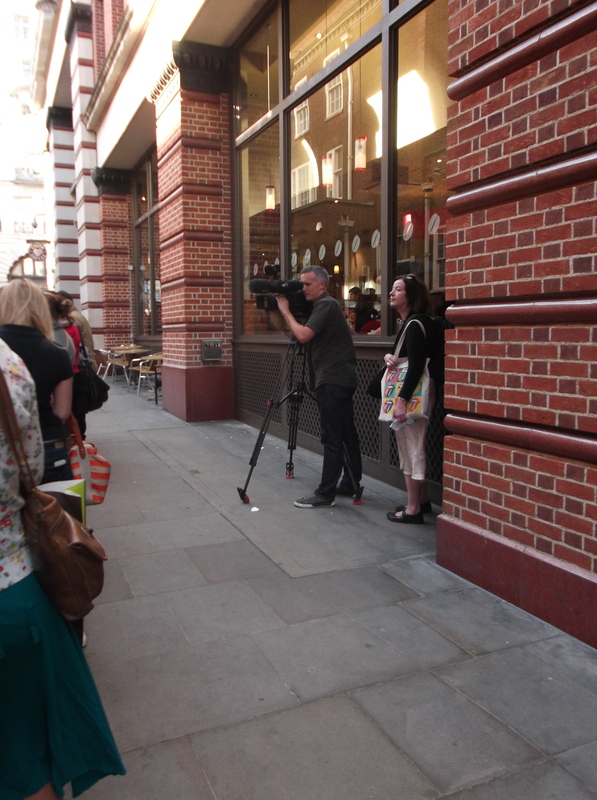 A camera crew showed up and interviewed people, but not me. I was number 182 in the queue. 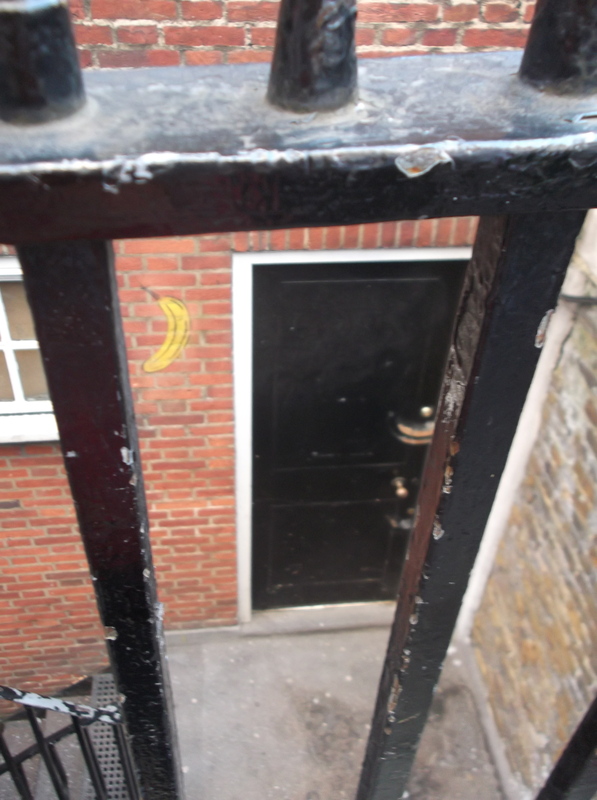 There was a banana on a wall by a door too. 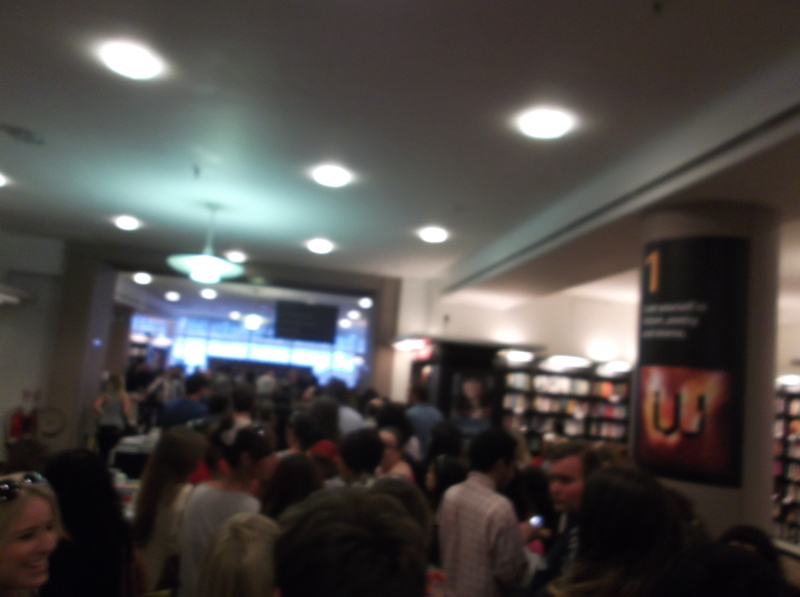 It was another hour and a half of standing and waiting until I got my chance to get my book signed. They herded us like cattle as we swarmed upstairs. It wasn’t practical because we were put in a huge group and then were slowly whittled down to single file for the signing. It made it seem like the process took FOREVER! The weirdest thing about the event was that once people learned I was from Seattle, I became a little celebrity myself. They’re eyes got big and they exclaimed, ‘You’re from Seattle?! Wow!” I think I might have been the only person from Seattle there, but I had to go. We were also given the chance to have the first book personally signed. Most people had their names. I chose Seattle. 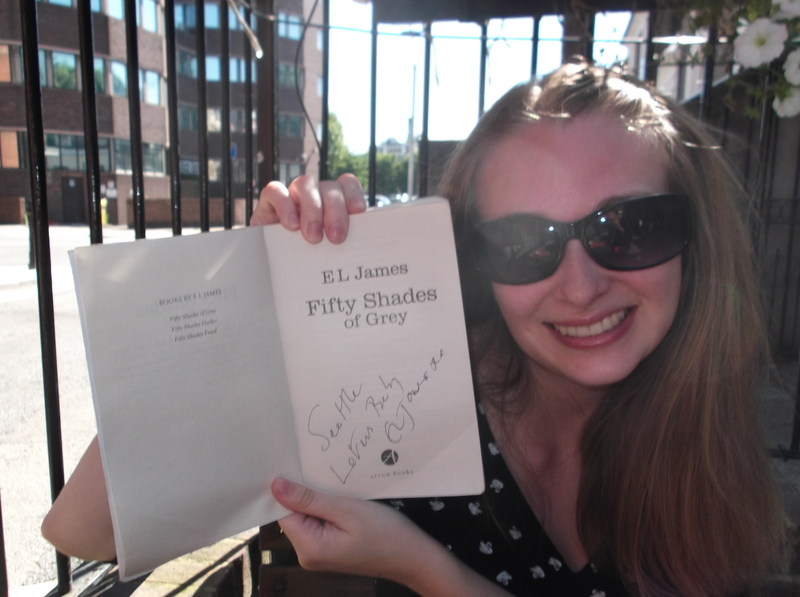 The PR girls and EL James herself were surprised when it came to be my turn. I shook her hand, and gave her the postcard. I thanked her for her time and she was so sweet and genuinely kind. She signed my book and I took my leave. People were asking me what number I had been when I left, there were LOADS more people waiting and it had been about two hours of signing already. Was it worth it standing for that long period of time? Not for my feet, (I have problems, see how small they are?) but nevertheless I’m glad I stuck it out. Thank goodness for the Kindle app on my ipod and overall it was a very interesting evening. The energy of those who bought the beautiful trilogy editions (they were stunning) was infectious. There was a universal look of embarrassment as well. I was most surprised by the range of ages. It wasn’t all middle aged women, there were girls younger than myself giggling over the spectacle of the event. It wasn’t about what I thought about the books, it was about being there and experiencing it all. 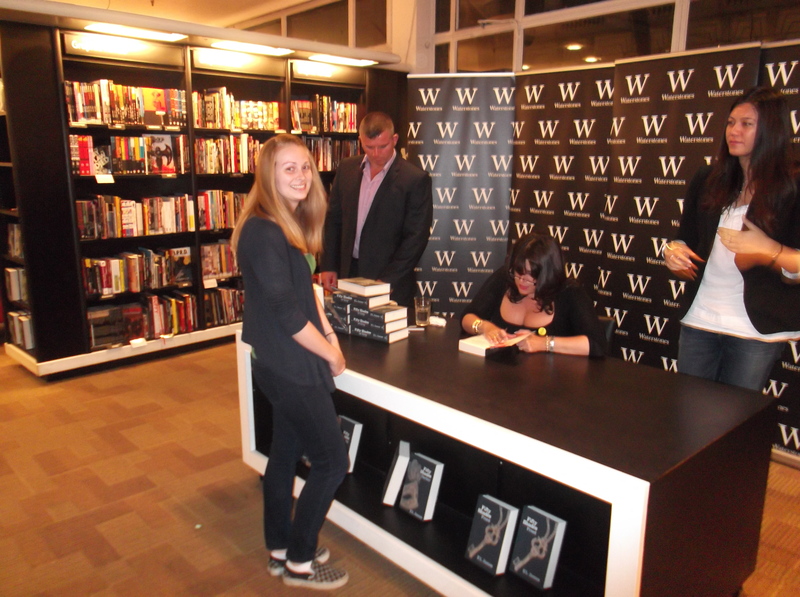 It was my night with EL James. Ashley!!!! I’m glad I wasn’t the only one not that impressed with the books. I bought the first one because of the spectacle of it but couldn’t really get past the first 50 pages. It seemed a little ridiculous.